The November 2014 AgNut Community of Practice call featured a report out on the first-ever agriculture-nutrition track at the Grand Challenges Annual Meeting 2014, held in October 2014 in Seattle, Washington, USA. 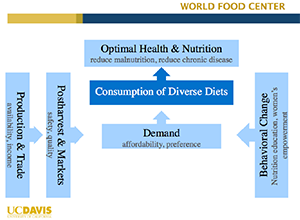 Laura Birx with the Bill & Melinda Gates Foundation, Josette Lewis and Edye Kuyper, both with the UC Davis World Food Center, were involved in organizing the event, and presented a summary of the four sessions: Diets, Markets, Convenience, and Demand. Key findings and their implications for future activities were shared on the call, along with an overview of the (relatively) new World Food Center. Additional session overviews and presentations are available at the World Food Center website. Laura Birx provided an overview of current funding opportunities available through the Gates Foundation.